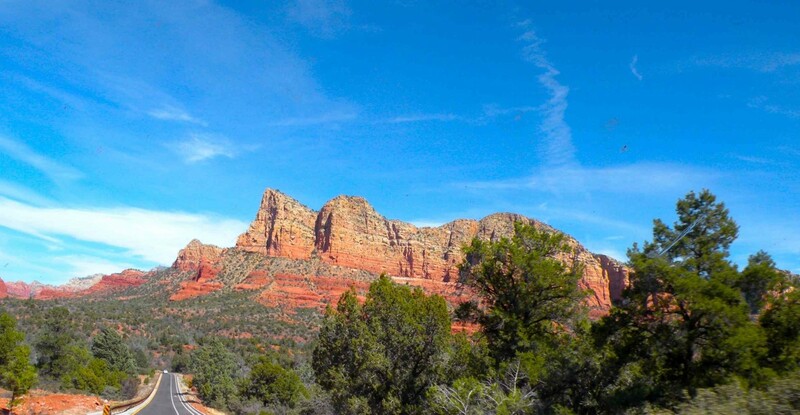 As a full-time RV'er, Stephanie writes about many natural wonders to be found in the U.S. National Parks and Monuments are her favorites. Devils Tower National Monument, located in the Black Hills of northeastern Wyoming, is 1262 feet high, a startling monolith rising up out of the flat lands around it. In1906, Theodore Roosevelt declared it the first National Monument. 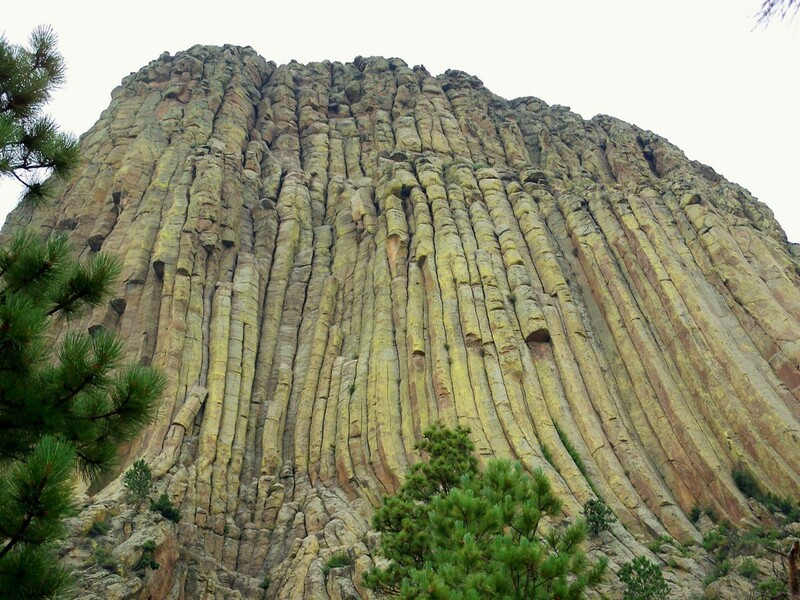 Although there are several theories of how Devils Tower was formed, scientists still do not all agree on its history. One theory says that it is a volcanic neck, also called a volcanic plug, which was formed when hot magma within a volcanic vent cooled and hardened. As the lava cooled, hexagonal columns formed. Over the years, the soil around it eroded, until only the rock formation is left. Other geologists believe that the Tower is a laccolith, an intrusion of hot magma from deep in the earth that pushed up a bulge in the rock, but never actually became a volcano. As the hot rock cooled, the eight-sided columns were formed around the sides. Further cooling caused the columns to shrink and pull away from each other forming deep grooves between them. While the tower was probably visible one or two million years ago, erosion around the rock over the course of the centuries has exposed, and will continue to expose, more of the base. Driving towards the monument, one can see it rising up over 1200' above the Belle Fourche River and surrounding plains.The rock formation has presented a mystery and a challenge to visitors for hundreds of years. Native American tribes have built legends around it, and its nearly straight sides have challenged rock climbers to scale it. 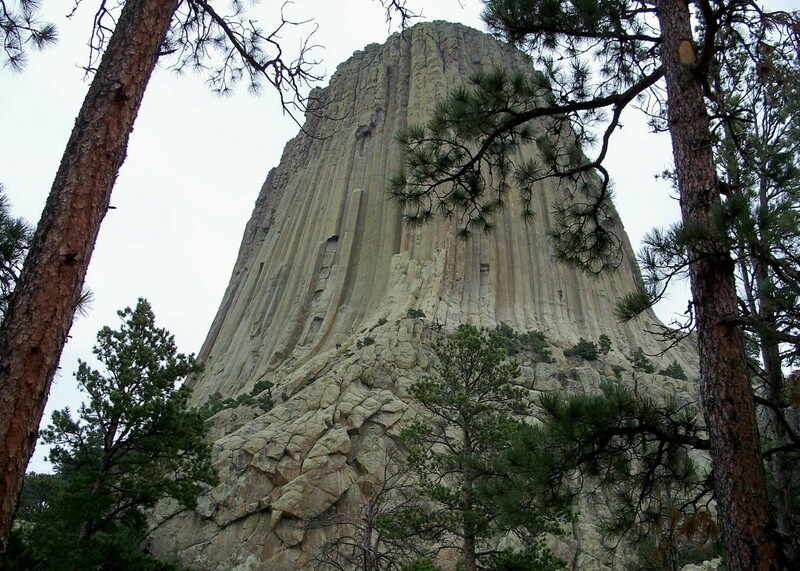 About 1% of the 400,000 visitors to Devils Tower come to the monument to climb it. 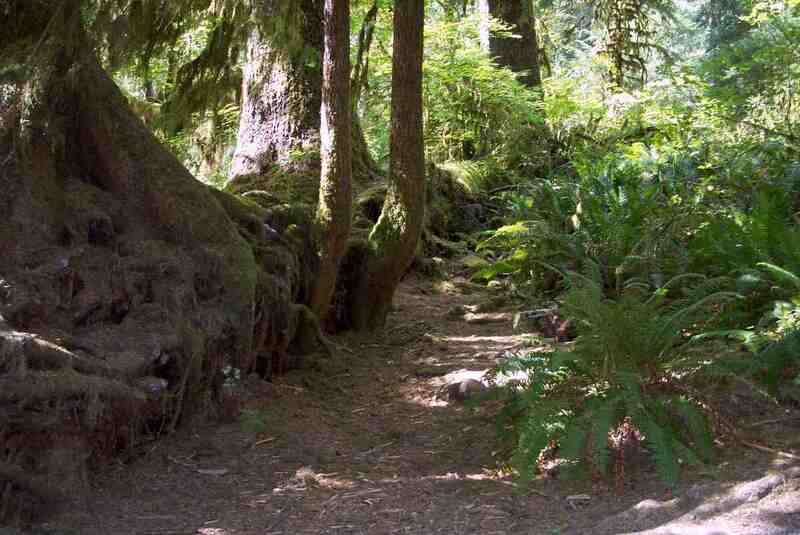 Other visitors walk the 1.3 mile path around it or picnic in its shadow. More than 20 Native American tribes have cultural ties and legends about Devils Tower and many consider it to be a sacred place. The name "Devils Tower" is fairly recent as the rock has been called Bear Lodge by the Lakotas and other names by other tribes. Because it is considered a sacred place by many of Native American tribes, there is opposition to the Tower being used for climbing. The National Park Service compromised by closing the Tower to climbers during the month of June when many sacred ceremonies are conducted at Devils Tower. That Devils Tower has great spiritual meaning to many Native Americans is evident as many brightly colored prayer bundles are seen hanging in the trees and bushes along the trail around it. Signs on the trail ask visitors not to touch the prayer bundles as they have spiritual meaning to the people who put them there. Traditional ceremonial rituals are still performed at Devils Tower and include prayer offerings, sweatlodge ceremonies, vision quests, the Sun Dance and sacred narratives about the origin of Devils Tower. Known by several other names by Native Americans, the place we know as Devils Tower was prominent in the legends of the Arapaho, Crow, Cheyenne, Kiowa, Lakota and Shoshone tribes long before early American immigrants reached Wyoming. In Native American lore, the name “Devils Tower” was unknown, and the rock was known by names such as: Bear Lodge, Bear’s Tipi, Bear’s Lodge, Bear’s House, Bear’s Lair, ear’s Lodge Butte. Although each tribe had its own legend of how the monolith came to be, many of the stories featured great bears, probably the reason why Bears so often appeared in the legendary names. Lakota, Kiowa and Sioux legends are very similar. In each story, children out playing encountered bears who chased them, wanting to do them harm. The Great Spirit saved them by raising the rock beneath them to a great height that the bears couldn’t climb. The bears tried to climb the steep sides of the rock, but just slid down the steep sides leaving their giant claw marks. These grooves can be seen in the sides of the tower today. In 1941, professional parachutist George Hopkins parachuted onto the top of Devils Tower. The 1000 foot rope that was dropped with him (which he intended to use to make his way down) missed the top of the tower and landed on the side of the tower where he couldn’t reach it. He didn’t count on being stranded for 6 days while rescuers tried to reach him, but he made the most of the publicity. While he sat on top of the tower waiting for rescue, supplies and blankets were dropped by plane to him. The National Park Service maintains a 1.3 mile trail around the tower. As it sounded like an easy walk on more or less flat ground, we decided to hike around it. As with many trails that look easy, looks can be deceiving. Walking the trail, it seemed as if it was all uphill. Even the downhill parts felt uphill! And I'm pretty sure they lied about how long it was. But the tower is an interesting thing to see. 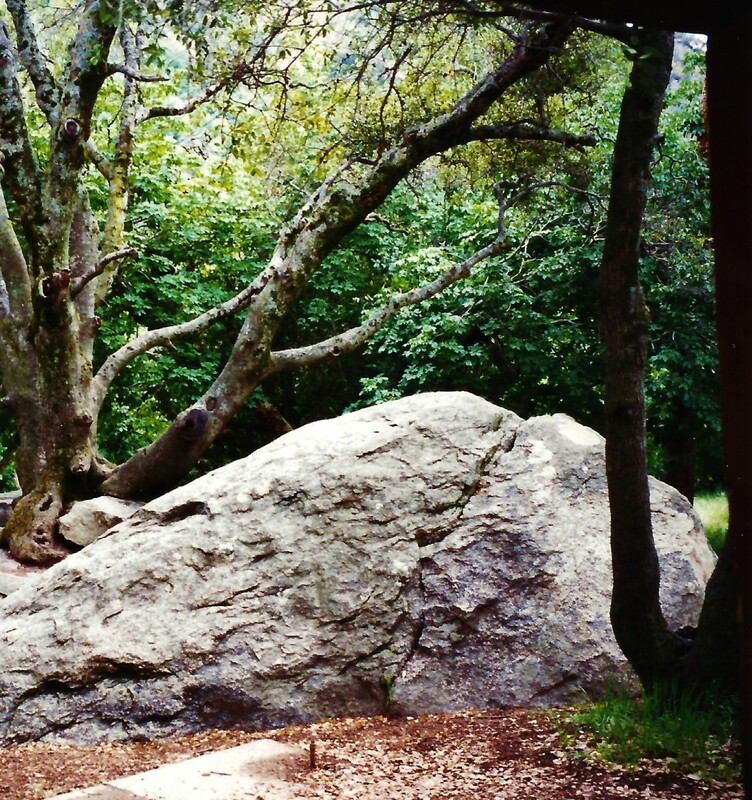 From a distance, it looks like a giant rock rising out of the earth. Close up, one can see the many individual columns that form the rock, and only wonder at how they were really formed. It's not surprising that Native Americans who lived near the rock for generations tried to explain the unusual rock formation and the vertical grooves cut into its sides. Rock climbers view the vertical walls of Devils Tower as a difficult challenge. We were fascinated by the rock climbers making their way up the nearly 1200 ft. sheer walls and amazed at at the number of climbers who clung to those walls in various stages of reaching the top. There are a hundred and twenty climbing routes on the tower, some more difficult than others. Experienced climbers can reach the summit in about 4 hours, then rappel back down. The visitor center says that only a third of those who try it reach the top. The National Park Service operates a very nice small campground at Devils Tower National Monument. The campground is wooded, but has some sites with a good view of Devils Tower. Like most National Parks campgrounds, there is dry camping only. There are restrooms in the campground and there is a dump station and water filling station available. There are no hookups at the campsites. Devils Tower National Monument, as it stands alone on the Wyoming prarie, is an amazing sight. Sometimes it is shrouded in fog which suddenly clears to reveal the rock rising up to what seems to be a great height. We can believe that it was formed by an ancient volcano or by hot magma pushing up from the center of the earth. Or we can choose to believe that it was formed by the Great Spirit to save the lives of seven children who were being chased by giant bears. However it was formed, it is not surprising that this gigantic monolith mysteriously rising up from the prairie has inspired awe and legends. Love to Write? Join HubPages! If you love to write, why not join HubPages? Choose any topic: travel, how to, humor parenting, or any other topic of your choice. You can write at your own pace and be part of a supportive Hubber community. Make money writing on HubPages! Click here to join. RVing along the Olympic Coast of Washington. 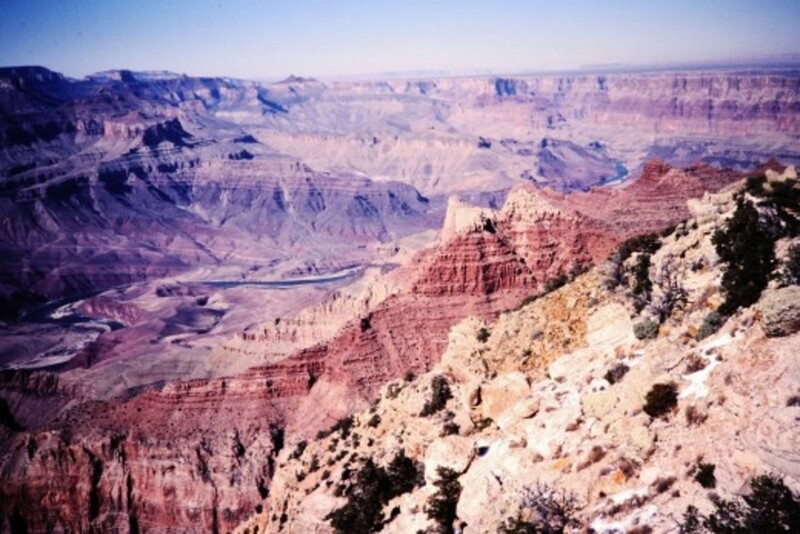 Photographs include pictures of the rugged, Pacific coastline and RV campsites on the coast. Includes information on RV camping, lodging, and travel tips. Thomdrilling - It's definitely worth a stop to see Devils Tower National Monument. Enjoy! Great photos and article. We are planning on going through this area in late August. 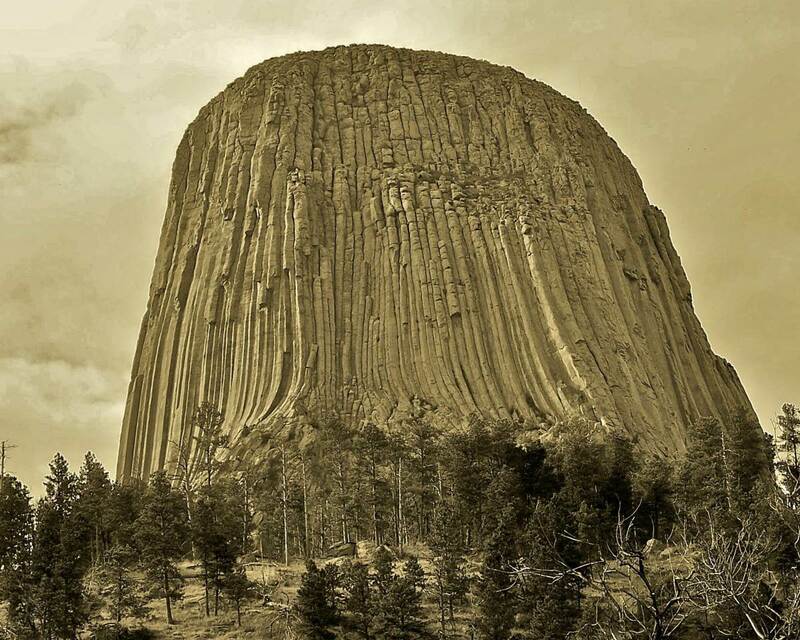 Nell Rose - I had forgotten that Devils Tower was in the movie, "Close Encounters of the Third Kind," until I started getting comments on this hub. It is a very spiritual and unique place, and attracts many different kinds of people, perhaps even aliens! :) Thanks for visiting my hub and for your comments! Docmo - Thanks so much for your kind comments! Devils tower is quite a fascinating place. I found the rock formation to be so photogenic, and the changing light at different times of the day gave it many different looks. I'm glad you enjoyed the article! Wonderful pics, interesting history and so much detail.. you have done a great job writing about this mystic monument- voted up! Billybuc - I've only seen Devils Tower once, but it was a terrific experience. It is an awesome and very spiritual place. KDuBarry03 - Devils Tower is an amazing place with so many interesting myths surrounding it. I agree that I wouldn't want to be stuck on top of it - even overnight would be too much! 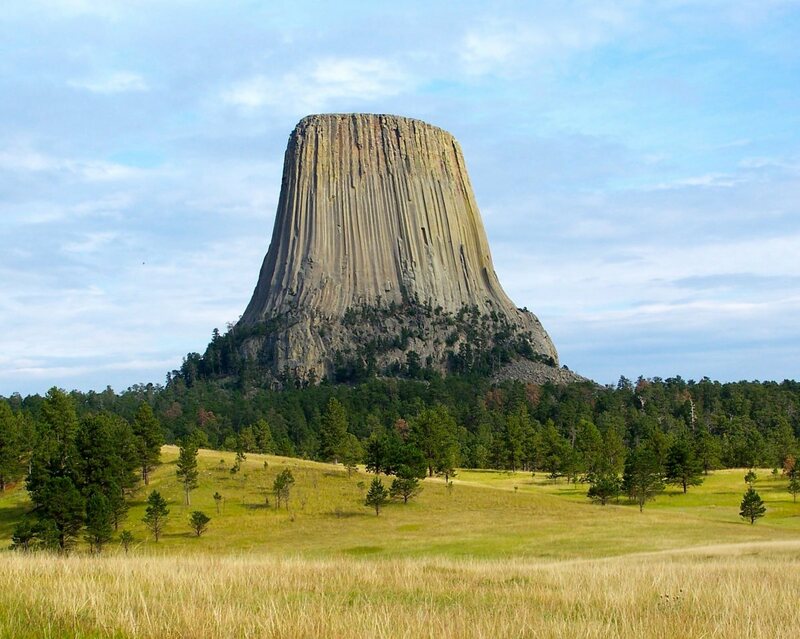 Recently, I watched the movie, Close Encounters again and Devils Tower played a big role in the movie. Having visited it in person added so much to the experience. Thanks so much for your nice comments and for the Share! Great hub; I love this monument and go see it every time I'm in the area....love this hub! Pstrauble48 - How lucky you were to spy the UFO while visiting Devils Tower! :) It is a very spiritual and even eerie place. I just ordered the DVD of Close Encounters; I think it will be even more interesting after actually visiting Devils Tower. Thanks so much for sharing your comments here! How cool is this. I went to see Devils' Tower when I lived in South Dakota. It was the year the movie Close Encounters came out. So of course there was a lot of mystery associated with it. As we spied it across the way, we could see the huge UFO hovering overhead. It was well worth the trip. So glad you shared this with us. AudreyHowitt - Thanks for visiting my hub on Devils Tower - I'm glad you enjoyed it and hope you are able to visit it some day. 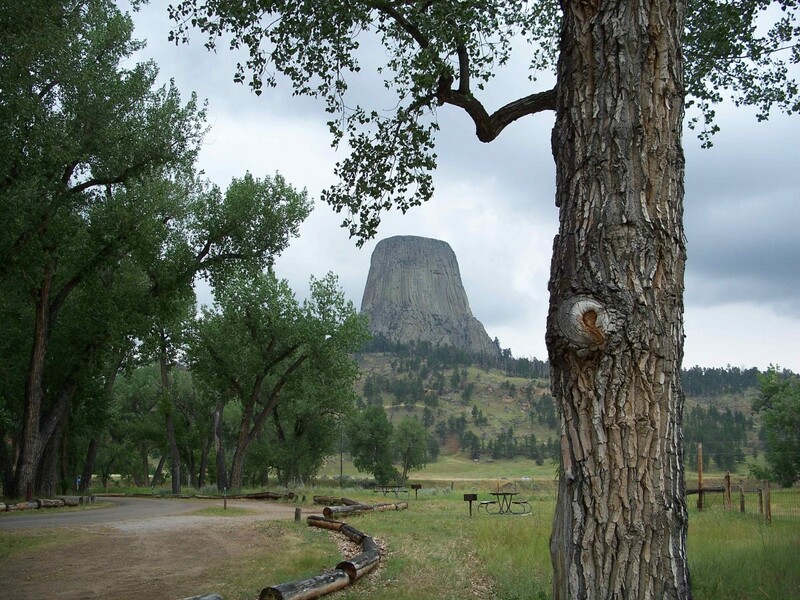 Vocalcoach - Devils Tower National Monument is a very amazing and spiritual place. https://hubpages.com/my/hubs/comments#I'm sure you'll find it interesting if you decide to visit. Thanks for the comment and the votes! This is one of those places that I have always wanted to visit! Thank you for this great hub!! I've been intrigued with Devils Tower ever since the film "Close Encounters" and I love this hub! Sure would like to visit amazing place one day. Thanks and voted up! grandmapearl - Devils Tower National Monument was an awe inspiring place. I'm so glad you enjoyed the article and virtual tour! Thanks so much for your lovely comment and for the share! I can tell you were inspired by this awesome place. I love your photos as well. A wonderfully well-written presentation. I felt like I was really there. You know, ever since I saw this in "Close Encounters of the Third Kind" I have wondered about it. Thanks for all the good information and a great Hub! Thank you also for the lovely fanmail. Voted Up and pushed many buttons, also shared. Tammyswallow - Devils Tower is an amazing place for a hike, or rock climbing. There's a lot of interesting Native American lore connected with the tower, too. I'm so glad that you liked the hub and the photographs - I did enjoy my visit there and loved photographing the tower from different angles and in different lights. Wow.. I have never heard of this. This sounds like a road trip I would love. Thanks for the great photos and informative look into this destination. Awesome! Jeannieinabottle - Devils Tower is a unique and spiritual place. The rock formation is unlike any I have seen - it was quite interesting. This is a really interesting hub and full of beautiful photos. Thank you for sharing this with us! Voted up and beautiful! Epigramman, renowned of song and story, you leave me speechless with your words! I'm so glad to meet you...thank you for visiting my Devils Tower hub and for your kind comments! I know I'll be visiting your poetry often now that I've had a taste of it! Hi Rorshak, Thank you for your comments! I'm glad you enjoyed my hub and photographs. Awesome hub. I really enjoyed it. The pictures that you used were wonderful. Keep up the great work! You brought up a good point. I should have discussed more of the history of the name in my hub. The original Native American names for the tower were Bear Lodge, Bear's Tipi, Bear House and other names that had nothing to do with the devil. When white men came to the place they misinterpreted the Indian name to mean Bad God's place and named it Devil's Tower. I believe that some Native American tribes would like to rename the tower to one of the original names. Fantastic Hub Stephanie. I hope to visit it one day! Excellent Photos. I would really plan to visit the place. This is really nice monument.. Thank you, Peggy! My photos of Devils Tower are some of my favorites from our travels through Wyoming, and I was happy to share them. It is funny how some of our childhood memories remain so clear and detailed. We did enjoy our hike around the Tower, but I think that visitors who see it up close from even one angle get a wonderful feeling for the place. Obviously, you must have been impressed when you saw it as a child. Thanks for your ratings and for your comments! Your photos of Devils Tower National Monument are wonderful. I remember seeing it as a kid and well remember the bear story as to all those claw marks. Funny how some things stick in one's mind. We did not walk around it as you did however. Even though it was a hike from what you said, I am certain that you were happy to have done it seeing it from all angles. Thanks for this informative hub. Rated beautiful! Ahbless — How wonderful that you were able to experience all the wonders of nature that Alaska has to offer! We were there for 2 months and barely scratched the surface of that wild and wonderful state. Thanks for visiting my hub! Cyoung — Glad you enjoyed the bit of history about Devils tower. The Indian lore is ancient, and I found it interesting that so many of the old stories featured bears. Thanks for the Tweet and for your comments! I love natural wonders of our world and lived in Alaska 28 years. I was a tour guide for about 10 years and got to experience its amazing wonders and even was paid to take people all over Alaska to tell them about it. I've always been an outdoors type person and have never been to Devils Tower. 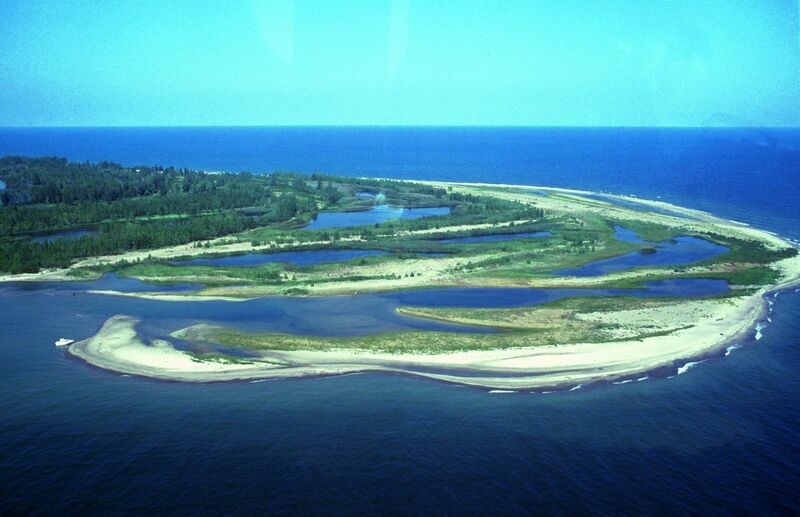 I will definitely have to make it out there this summer after reading your hub. I appreciate all the history and the very well written descriptions with pictures. Great hub, I voted it up and tweeted this out to mycampingsupply.com twitter followers. Thank you for your comment, Carmen. Devils Tower is so photogenic that it was easy to get good photographs. Since I was using a digital camera, I snapped away from all angles. I hope that you do get a chance to see the Tower in person some day. The first picture is breathtakingly beautiful...and the illustration makes Devils Tower a beauty that one has to see personally. Awesome hub, Stephanie! This was a great hub--well done! I've heard of this formation of course, as a geology enthusiast, but have never been there. In appearance, it is very similar to Devil's Postpile National Monument in California. The columns are actually the formation taken by the cooling of basaltic lava. Given that the top surface of the Postpile location is much more accessible, the octagonal "floor tiles" show this fracture pattern clearly. It is a reflection of the crystalline structure of the rock itself. CVanthul- Thank you! I hope you do have a chance to see Devils Tower in person. It's quite unique! Wonderfully well-written, Stephanie, and very informative. Now I want to go see it! Hello JSParker, It's so hard to see everything, even in 30 days! The Buffalo Roundup at Custer State Park sounds like so much fun! We've been to Custer, but never during roundup time. Glad to hear that you had a good trip RVing. We love it and love the freedom of having our "home on wheels" with us when we travel. What a nice Hub! Your photo are excellent. Reading this, I'm sorry we didn't go out of our way to see Devil's Tower. We were hightailing it out of Jackson, WY to the Annual Buffalo Roundup in South Dakota's Custer State Park. That was during our 30-day RV trip from L.A. to Detroit with four adults in a 26-foot rented RV. What a trip! Some 30 years ago as a young boy my mother took my sister and I to see "Close Encounters of The Third Kind". A fun movie, but it ultimately haunted me because I was fixated on this remarkable land structure called Devil's Tower, which was the entire focal point of the movie about alien visitors. It's truly God's handiwork at its best. Thanks for visiting, Greensleeves. I hope you find some others that you like. Nice page Stephanie. I think I'll have to take a look at one or two of your other travel pages! This is such a nice geological structure, they remind me these similar geological structure found in Africa known as Inselberg. I know that both are from distinct origins. Thanks for stopping by to read my hub Tugbo. Glad you liked it. BlueGlobal -- Devils Towers is a beautiful sight to drive by, but to get the full impact of the place, you should stop to walk around it. The rock formation itself is just mysterious and magical. Thanks for your comments! Thank you, Denise! I'm out of the loop this week as I didn't realize this was a featured hub, but it's nice to know. Haha...yes, I always wanted a daughter, but I didn't intend to steal yours! LOL That was a little confusing, wasn't it? I visited this site when I was 5 years old and still remember it vividly. 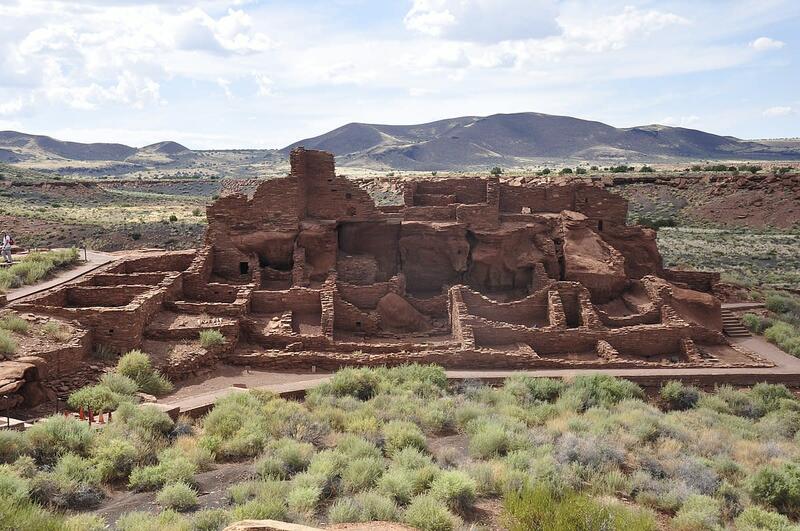 You did a fabulous job writing about this amazing piece of the American landscape. Beutiful hub, Stephanie. Congratulations on it being a featured hub this week-well deserving. It was a very interesting hub, as usual. Voted up and awesome. Congratulations, also about your 'new daughter' cardelean, LOL I noticed that announcement in this weeks hubpages newsletter. Great photos, BTW - Enjoy your travels. Dawn- I believe there was a stuffed grizzly, but I don't remember having to learn about them before the hike. There were quite a few people on the paths the day we were there. IndoVillas - I'm not a rock climber, but there were several brave climbers on the tower the day we were there. We didn't see if they reached the summit that day. MsQuestion - I was on the lookout for rattlesnakes, too. It was quite a warm day when we visited, and snakes were are real possibility. I was happy not to see any! Thanks everyone for visiting my hub. I appreciate your comments! Nice Hub Stephanie! I enjoyed my visit when we went out west. I do not live close enough to go a lot but remember my trip out there well. Do they still make you learn some about Grizzlies before going on the hike? I remember walking through the visitor building and seeing some really big stuffed grizzlies! My Mom has the picture she bought from there that had Native Americans standing on top with spears in their hands with a giant bear clawing at the side of the tower. Nice Hub! That's a very intriguing place, looks like it's quite an adventure to try reaching the top. Great Hub! Very well done! This is amazing hub, first time am reading about this place. Hub is informative and interesting. well written as well. Thanks for sharing. Very informative hub! I remember walking around Devil's Tower and being paranoid I was going to step on a Rattlesnake (I didn't)! ParadiseForever—Thanks for stopping by and and for your kind comments on my hub. This was an awe inspiring place, and I enjoyed sharing the photographs I took while visiting it. Aamna—Thanks for sharing the legend of Devil's Tower. Several of the Native American legends about the formation of the tower are similar, featuring children trying to escape great bears. I like the idea of the children reaching the sky and becoming a star constellation! 7 years ago from Chennai, India. Very interesting place and very informative hub. Great work Stephanie. As you mentioned, this place seems to be very awe inspiring and unusual. Beautiful snaps by you. Thanks for taking us to a virtual tour by your inspiring hub. Keep writing! What an amazing site! I had never heard or seen of this place before. Very spectacular and impressive. Makes you think of the other natural wonders out there that you may also not be aware of. Devils Tower National Park is a really spooky place at certain times of the year. Your hub does a great job giving the history and connection of native American Indian tribes to the location. The Devils Tower National Park, and especially the Devils Tower itself, were used in the climax of the movie - Close Encounters of the Third Kind. Hello Tlpoague, Thanks for stopping by to read my hub and to comment. You've probably seen Devils Tower from many different angles and at different times of the year– I would love to see it in the spring and fall! It's nice to know you have good memories of this amazing place. Hello again Prasetio. Thanks for stopping by to read my hub. Devils Tower National Monument is quite an unusual place. It's easy to see why some people find it a spiritual place, too. I had never knew about this place before. I am glad to know this from you and I really enjoy all stunning pictures of Devils Tower National monument. Rated up! Hi Austinstar, Thanks for visiting and commenting on my hub! I enjoyed photographing Devils Tower—glad you liked the pictures. I've always wanted to see this rock! Thank you for the photos. Thank you, Anna! I'm glad you enjoyed the Hub. Devils Tower is quite an unusual and awe inspiring place.